If your a student and do not already have a Linkedin profile of your own, follow these 5 easy steps and you'll be on your way to utilizing one of the best social media platforms for job searching and professional networking! It doesn't have to entail booking a professional photo shoot, but there are a few things you'll want to keep in mind. If you are making "the duck face", are with a large group of people, or are engaging in non-work related behavior in the photo (chugging a beer with friends or crowd surfing at a concert), it might not be the wisest choice for your Linkedin photo. Remember, Linkedin is for you to connect to professionals & employers and is really about making a good first impression. So make that impression count and keep your photo as professional as possible. Your headline is one of the first things others actually read on your profile before they get to the other content. Highlight what you are currently doing and what you are looking for. For example, "Student at Brock University" isn't eye catching and is rather vague. A headline like "Marketing BA Candidate at Brock University Seeking Internship Opportunities in Business Promotions" is specific and informative. As the section title suggests, summarize what you are currently doing and mention your goals and future plans as well as any other skills or interests related to this. Make sure your content is concise yet professional! And if you'd like, mention opportunities you are looking for! This will help your audience figure out your overall objective professionally and may lead to connections which can aid you in reaching your goals. This includes: work experiences, volunteer experiences, professional development, certifications, diplomas/degrees and awards (to name a few). Obviously, you may not have content for every category, but that's perfectly alright! Just like with a resume, you don't need to have an experience for every section. However, adding your experiences may highlight areas you could be working on or areas in need of improvement. For example, if you have no volunteer experience, perhaps it's time to explore some volunteer opportunities so you can implement that section into your profile. Adding work samples, photographic examples and content, creating a personalized URL, and adding specific keywords to your "Skills" section are all ways you can customize your profile and set it apart from the rest! Linkedin is constantly updating the ways in which you can customize your content, so keep in mind that customizing your profile will be an ongoing work in progress, much like a resume! So there you have it! 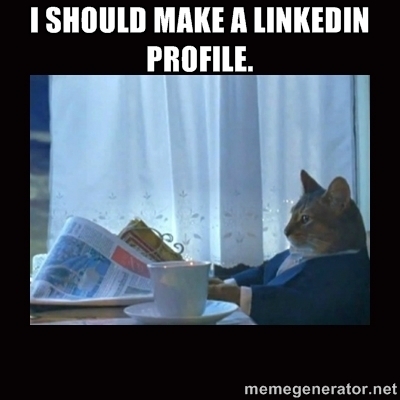 A simple guide to creating the perfect student Linkedin profile! And don't forget, we offer free drop-in Linkedin Profile Reviews here at the Career Resource Centre at Brock. Using our newly developed criteria checklist, we can go through your profile and ensure that the content is the best it can be. Additionally, we offer handouts on building your student profile and are more than happy to aid in any way possible! So what are you waiting for? Get Linkedin today!